Happy August! This week in feminist-friendly entertainment features a new album from Santigold; the Miseducation of Cameron Post; the return of Martha Stewart and Snoop Dogg’s reality show; and more. Chloe Grace Moretz stars as a teenager sent to gay conversion therapy camp in the ‘90s, where she finds solace in two new friends (played by Sasha Lane and Forrest Gooduck); the movie is co-written and directed by Desiree Akhavan. (Oops, we got the release date wrong last week!) Out Friday, August 3. Augustine Frizzel’s debut feature is a semi-autobiographical comedy about two high school dropouts named Angela (Maia Mitchell) and Jessie (Camila Morrone) who are just trying to get to the beach to celebrate Jessie’s 17th birthday—but keep facing obstacles on the way. Out Friday, August 3. Martha Stewart and Snoop Dogg hang out with celebrity friends including RuPaul, Michelle Rodriguez, and Kelly and Sharon Osbourne in this reality series, which returned this week after a long hiatus. The next episode airs Wednesday, August 8 on VH1; watch past episodes on VH1.com. This comedy series about two second-generation Asian-Canadian women returns for a second season; it was co-created, co-executive produced, and stars Amanda Joy and Samantha Wan. Premieres Saturday, August 4 on OMNI. Miss Eaves’ latest song, “Kiss Kiss I’m Fabulous,” is an ode to self-confidence and black girl magic. Read more on BUST.com and catch Miss Eaves' performance at BUST’s 25th anniversary party later this month. ICYMI, this week we premiered the latest single by New York powerhouse Fiona Silver. Read our interview with her on BUST.com. This collection of essays is upbeat and funny while also tackling serious topics ilke depression. 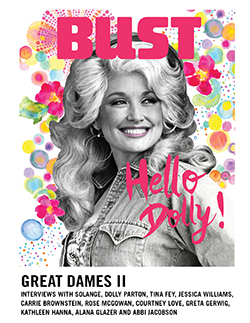 See BUST’s August/September 2018 issue for review. Out Tuesday, August 7. Journalist Beth Macy documents America’s 20-year opioid addiction crisis in this nonfiction book. Out Tuesday, August 7. Crystal Hana Kim’s debut novel follows a pair of ill-fated lovers and their families, set during the Korean War. Out Tuesday, August 7.